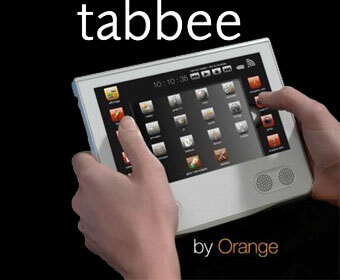 Orange is targeting the home market with the launch in June of a new touchscreen tablet called the Tabbee. The wifi-only device offers quick access to multimedia or internet content held on either a home’s set-top box or its PC. The operator envisages users turning to the domesticated device when they can’t be bothered to boot up a home PC, or the computer is being monopolised by another occupant of the house. The Tabbee, which is manufactured exclusively for the operator by Sagem, will initially only be available in France at a cost of Euro 299, a relatively high price that probably limit its chances of a mass take-up. But the Tabbee has the potential to stray into more interesting territory. Orange confirmed that the device will have a 3G capability but not from the June launch. The operator says it is “still fine-tuning the commercial offer” for 3G. A 3G capability might make the Tabbee a more attractive proposition, and possibly closer to a netbook (it has an on-screen keyboard). The lack of a voice capability however means users could not drop their existing mobile phone in favour of the new device. And the precedent for the Tabbee is unclear. The concept sounds similar to the iPod touch except with a 7 inch screen it’s twice the size of the Apple device. Another comparison might be with Nokia’s N800 tablet which was replaced by the N810 which was subsequently discontinued, so not very encouraging. On the other hand, T-Mobile is thought to be working on a similarly-sounding “tablet-netbook”, so there are signs that other operators might be reaching similar conclusions and starting to move in the same direction.